A self-weeding transfer that leaves no background plastic polymer behind for a softer hand & professional look. 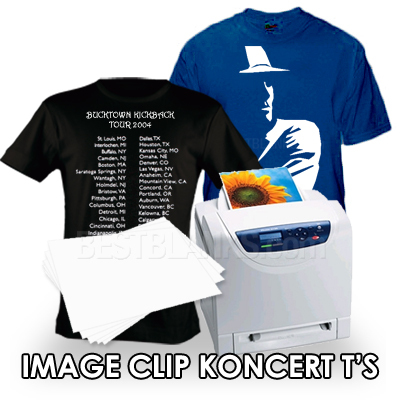 Neenah IMAGE CLIP Koncert T's heat transfer paper is self-weeding and leaves no background plastic polymer behind. This transfer paper runs in most newer oil or oil-less laser printers. This heat transfer papers is designed for the heat transfer of a white image to pastel on dark and bright colored items including: T-shirts, handbags, mouse pads, coasters, leather articles, art papers, etc. 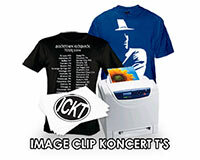 IMAGE CLIP Koncert T's works well on cotton, 50-50 blends and polyester. There is no need to trim the paper. Choose fabrics that have a tight weave.